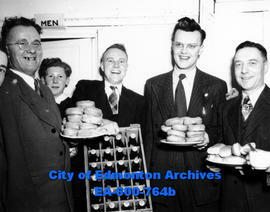 Official opening of the new clubhouse of the Maple Leaf Athletic Club (118 avenue). Club officials: (L-R) Earl Samis, unidentified boy, Harry Young, Stand Wood, Frank Arnold. 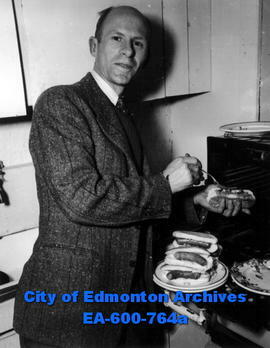 Official opening of the new clubhouse of the Maple Leaf Athletic Club (118 avenue): Henry White helps prepare hotdogs. Official opening of the new clubhouse of the Maple Leaf Athletic Club (118 avenue): some of the pee-wee hockey players who attended the party. Old wooden staircase in YWCA house. Opening ceremony of the Highlands Community League. Opening of Canadian Handicraft Guild: Dorothy Neilson and N.T. Miller. Opening of Canadian Handicraft Guild: Mrs. Hail, Mrs. P.J.A. Fleming, Mrs. Robert Driscoll. Opening of new wing of Salvation Army Eventide Home.